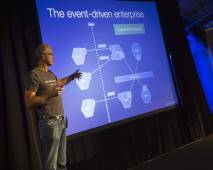 Thoughts about #microservices – less micro, more service? I’ve been giving talks on what are now called microservices for the past two years. The big idea is that in some situations rather than building a monolithic application (e.g. application = one huge WAR file) you should apply the Scale Cube (specifically y-axis splits aka. functional decomposition) and design your application as a collection of independently deployable services. I have often introduced the idea as “SOA light” since you are building a service-oriented architecture. The trouble with the term SOA, however, is that it is associated with a lot of baggage: SOAP, ESBs, heavyweight ceremony, etc. Instead, I’ve talked about “Decomposing the monolith” or “Decomposing the WAR”. I’ve also used the term modular, polyglot architecture but that’s a bit of a mouthful. At Oredev 2012, I encountered Fred George who was giving a talk on what he called microservices, which was a variant of what I had been talking about. What was especially intriguing about his approach was about how it pushed things to the extreme with a very heavy emphasis on very small services. The term microservices along with the idea of tiny 100 LOC services has got a fair amount of buzz recently. Martin fowler blogged about microservices and there has been some discussion on twitter. This entry was posted in microservices. Bookmark the permalink.